Blooms That Bind . . . The fact that wildflowers operate on a staggered blooming schedule adds appeal to the search for new varieties. As the growing season progresses, the hunt evolves, and three main organizing themes emerge: the pastel flowers of spring, the vivid flowers of summer, and finally all the rest, the eclectic flowers of autumn. The morning glory, which all urban commuters can appreciate during their walks to work, is one of the fall season’s most prominent cultivated flowers. Pink, blue, and purple blooms, carried on vines of heart-shaped leaves, look like the beads of a necklace as they trail up lattice work, twine lines, and around the trunks of trees throughout the gardens of the West Village. Out in the field, in this case along streetsides and vacant lots, there is a wildflower representative of this autumnal group: the Hedge Bindweed, Calystegia sepium. The wild morning glory of the West Village is easy to distinguish from its cultivated domestic cousins, including those which have gone feral. Morning glories grown in gardens are primary colorful and have leaves shaped like Valentine hearts. 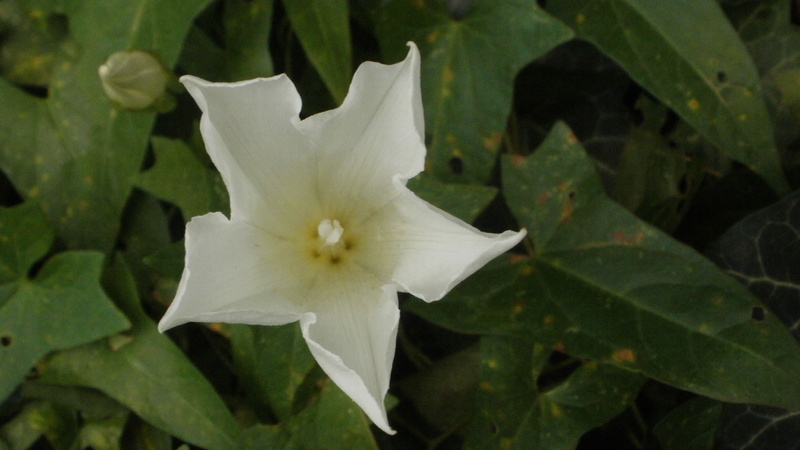 Hedge Bindweed sports a funnel of crisp white flower and a striking pointed leaf shaped like an arrowhead, or spade. Bindweed is a perennial in the morning-glory family, Convolvulaceae, with a cosmopolitan distribution throughout much of the world. 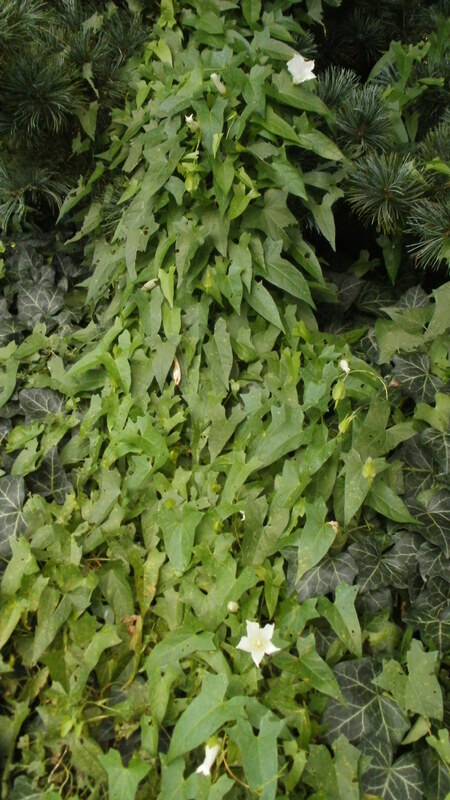 The plant grows as a vine that wraps tenaciously around whatever stands adjacent to it, be it light pole, hedge line, or tree trunk. The winding pattern runs counter-clockwise. Equally tenacious are the Bindweed’s roots and seeds. Once established, the plant sets down deep roots next to impossible to remove; all a gardener can do is get on his or her knees and weed, frequently. The seeds, too, are tough. These have a shape not unlike a quartered piece of fruit and, not so surprisingly, come is sets of four. Tests have revealed a remarkable shelf life of at least several decades. In early October I came across a good example growing in Hudson River Park. The term “thicket” was well on display as the Hedge Bindweed assumed its space along the tangled edge of an otherwise manicured lawn. A pretty string of white flowers trailing from the ground up to a tree trunk earned its place as a wildflower, rather than a weed, in my eyes.